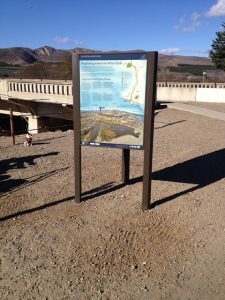 This kiosk near Main Street and the bike path educates visitors on the Ventura River Parkway project. If the Surfrider Foundation is dedicated to the oceans, waves, and beaches, why is the Ventura County Chapter a stakeholder in a river parkway project? The answer is deceptively simple. Due to the interconnectedness of all things, the health of the watershed is the health of the beaches. In addition, since beach access is a major concern of the Surfrider Foundation, we believe river access is important as well. The Ventura River is one of the last self-sustaining rivers in Southern California. It supports one of the greatest diversities of plants and animals in the region. It carries sediments that nourish Surfers’ Point and other downcoast beaches. Ever since people first arrived at its banks, the river has been an invaluable water source and gathering place. Over time, however, restrictive land use, invasive species, and other human-constructed barriers cut the people off from the river. The Ventura River Parkway plan seeks to restore the Ventura River ecosystem and recreate the human connection to the river that once existed. The plan has been developed by the Friends of the Ventura River coalition, of which Surfrider Ventura County is a member. For more information, check out the parkway’s page on the Friends of the Ventura River website, especially the map of the proposed park. Printed maps are available from the Surfrider Foundation Ventura County Chapter as well as many other nonprofits and retailers. This project was featured in the Ventura County Star on July 27, 2016! 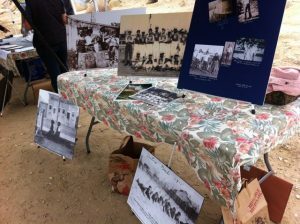 Historical photos on a table at a Ventura River Parkway event show how the people and the river used to be connected.